The first full week of April proved a reasonably exciting period, with migration picking up as classic early April species such as Reed, Sedge and Grasshopper Warblers, Yellow Wagtail, Eurasian Hobby, Common Tern and Common Cuckoo all increased in number across southern areas. However, with a north-easterly setting back in by the week’s end, northward progress is likely to be slow over the coming days. The easterly element to this week's winds ensured that things remained fairly chilly (aside Sunday and Monday, which were noticeably milder in the south as a warm front moved through) and there was a real premium of significant new finds. However, April is so often a month more about patch-working and appreciating the joys of spring migration rather than anticipating major rarity arrivals. And so it proved this week, for the main event of the seven-day period was one of the best spring Little Gull movements witnessed in many years. Little Gull, Attenborough NR, Nottinghamshire (Neil Loverock). A total of 283 reports of the species were logged on the BirdGuides sightings page this week, with the bulk of the movement taking place over 8-9th. Birds seemed to be dropping out the sky as the murk and rain associated with a slowly moving front drifted northwards, firstly over southern England in the morning, but spreading north into the Midlands as the day progressed. By the end of the day, it felt like almost every significant waterbody south of a line between The Wash and Mersey Estuary had produced at least one or two of these terrific birds. There were also some significant counts on 8th, particularly from around London, including 51 at King George Reservoir and 27+ at Walthamstow Wetlands. On 9th the highest numbers were further north, with sites such as Rutland Water and Blithfield Reservoir, Staffs, both attracting in excess of 20. Little Gull, Pine Lake, Lancashire (Stephen Tomlinson). Among these came the first trickle of Arctic Terns of the year, while Black Tern also appeared for the first time in 2019 when one was at Summer Leys, Northants, on 7th. Further birds were in Northamptonshire and Staffordshire on 8th, with three more in the Midlands on 9th. The first Little Terns were seen in Kent and West Sussex on 5th, but Sandwich Terns were surprisingly few and far between inland. A dark-morph Arctic Skua flew through Farmoor Reservoir, Oxon, on 8th. Ring Ouzel was another species prominent on the airwaves this week with 173 reports, many of which were at classic staging sites across the southern half of England and Wales. While numbers were far from exceptional, it was a solid showing of this birders' favourite and plenty of inland patches scored. Channel Wagtails were seen in Hertfordshire and Oxfordshire, with Blue-headed Wagtails at Abberton Reservoir, Essex, and Walthamstow Reservoirs, London. A light scattering of Common Redstarts and Pied Flycatchers was also noted. 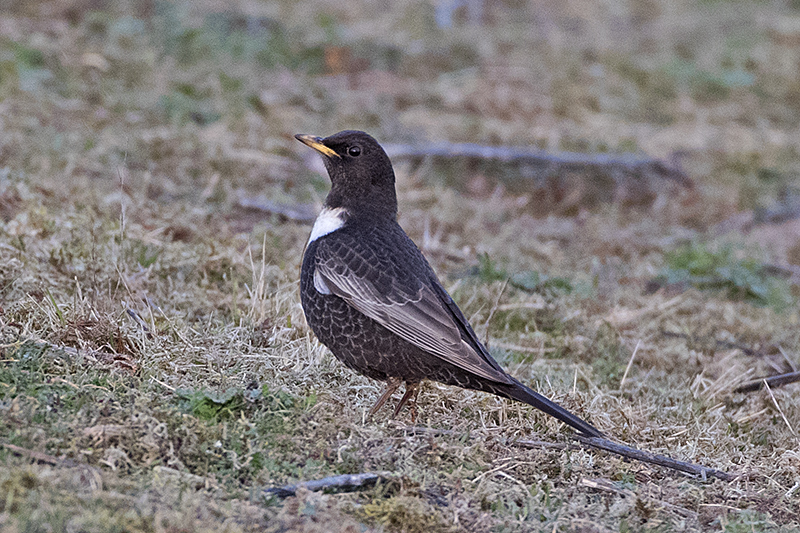 Ring Ouzel, Minsmere RSPB, Suffolk (Andrew Moon). Blue-headed Wagtail, Walthamstow Reservoirs, London (Josh Jones). The most significant rare bird 'discovery' of the week was the return of the American White-winged Scoter to the Lothian coastline. Present again off Musselburgh from 8th, it's a mystery as to where it's been in the intervening months since mid-November (it promptly disappeared after this column boldly predicted it as a daily feature until at least spring 2019 …). Wildfowl news otherwise concerned the resident American Black Duck still at Strontian, Highland, where this red-blooded drake appears to have fallen for the charms of one of his own hybrid offspring, having paired up with her. The drake Blue-winged Teal was still at Mellon Charles, Highland, to 7th, American Wigeon lingered in Rutland and Highland, while 11 Green-winged Teal were sighted. Ten Ring-necked Duck included a trio at Slapton Ley, Devon, and a fourth just down the coast at Beesands Ley. The Lesser Scaup lingered another week at Blagdon Lake, Somerset, a couple of Surf Scoter were off Musselburgh, Lothian, and the drake King Eider stuck around off the Nairn coast. In Lancashire, the apparent Grey-bellied Brant continued on the outer Ribble Estuary with Pink-footed Geese. 'Grey-bellied Brant', Banks Marsh, Lancashire (Stuart Darbyshire). White-billed Diver numbers remained unremarkable in the outer Moray Firth, with a peak of just two between Portsoy, Aberdeenshire, and Cullen, Moray. Pied-billed Grebes hung on at Loch of Spiggie, Shetland, and Loch Feorlin, Argyll. The recent Black-crowned Night Heron continued to prove elusive on St Mary's, Scilly, to 5th, when it was heard flying over Longstones after dark. Glossy Ibises were seen at 10 British and Irish sites. 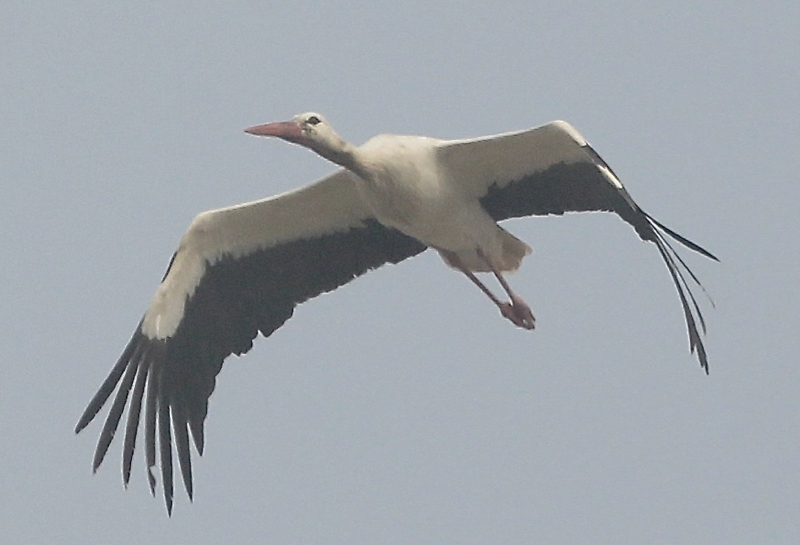 A White Stork flew over Dungeness, Kent, on 8th and was later tracked up the coast to Samphire Hoe. Then, on 9th, it spent a day around Worth Marsh at Sandwich Bay in dreary weather conditions. There were also records from Oxfordshire, Hampshire and the Isle of Wight. White Stork, Dungeness NNR, Kent (Chris Bond). 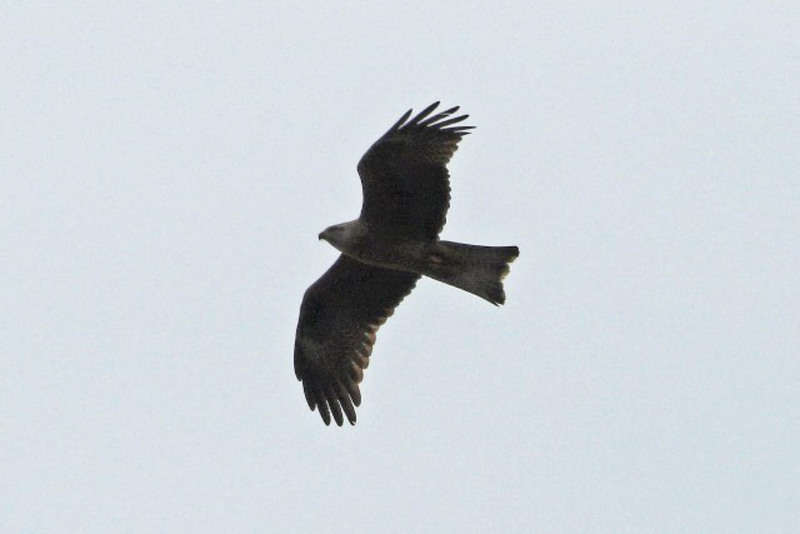 A Black Kite over Holyhead, Anglesey, on 6th was seen over Carmel Head and subsequently Dinas Dinlle, Gwynedd, the following day, before returning to South Stack on 9th. Another flew south over Pegwell Bay, Kent, on 4th. With the Rough-legged Buzzard still on St Martin's, Scilly, on 9th, the juvenile seen flying north along the north Cornwall coastline at Porthtowan and later Newquay on 6th was seemingly a different bird – and an excellent county record to boot. Three were seen in Norfolk and the Orkney bird lingered at Dounby. Black Kite, South Stack, Anglesey (Mark Leitch). Late news concerned an adult Ross's Gull at Cairnbulg, Aberdeenshire, on 31 March; this completes a memorable Arctic gull double for the site after December's Ivory Gull. Devon's Bonaparte's Gull reappeared at Penhill Marsh on 7th and nearby Pottington on 8th. A fine adult Ring-billed Gull was new at Abbotsbury Swannery, Dorset, on 3rd, with another past Hengistbury Head on 6th. In Co Kerry, two still lingered in the Tralee area. Both Lesser Yellowlegs remained in Cornwall and Dorset respectively, though their departures must now be imminent. The same could be said for the Long-billed Dowitcher, which was still at Frampton Marsh on 8th, and indeed the Spotted Sandpiper at Wexford Town, still there on 4th. Pegwell Bay, which had a bit of a purple patch this week, produced a Kentish Plover on 3rd. The first Eurasian Dotterel of the season are always welcome and the two at Cheesefoot Head, Hants, from 6th were quite early – so much so, in fact, that both were still largely in winter dress. Lesser Yellowlegs, Lodmoor RSPB, Dorset (Tony Davison). Honourable mention must go to the wide-ranging Pied Crow, which was on show at Seaford, East Sussex, until at least 6th, showing very well at times but reportedly resisting the temptation of snack-sized offerings from birders on site. Pied Crow, Seaford, East Sussex (Mark Leitch). The long-staying Great Spotted Cuckoo hung around on the Isle of Wight to at least 8th, when it was still crashing about amid the brambles at Wheelers' Bay, Ventnor. A Savi's Warbler sang at Pegwell Bay, Kent, on 3rd, with the Minsmere, Suffolk, bird again vocal on 4th and 7th. The Pallas's Warbler was still singing at Coverack, Cornwall, on 4th and Yellow-browed Warblers were logged at five sites (four in Britain and a single bird in Ireland). Five Hoopoes were seen this week, including a mobile but ultimately gettable individual at Winterton Dunes, Norfolk, from 4th, while another was glimpsed intermittently at Pegwell Bay, Kent. Despite the productive conditions grounding large numbers of hirundines across inland waterbodies, just a single confirmed Red-rumped Swallow was seen – at Kenfig NNR, Glamorgan, on 5th. Hoopoe, Winterton Dunes NNR, Norfolk (Alex Berryman). European Serins were seen in Cornwall and Dorset, while a very early Common Rosefinch arrived at Baltasound, Unst, Shetland, on 8th. A single Coues's Arctic Redpoll remained at Sculthorpe Moor, Norfolk. Common Rosefinch, Baltasound, Unst, Shetland (David Cooper). In Suffolk, a male White-spotted Bluethroat proved elusive at Herringfleet Marshes on 6-7th. A new Black-bellied Dipper arrived on Fair Isle, Shetland, on 4th and lingered to at least 9th, when both Great Grey Shrike and Northern Treecreeper were seen on the island. Perhaps the most significant news concerned the return of the Black-browed Albatross to Sylt, Germany, on 4th – this a welcome rediscovery after last year's bizarre behaviour which saw the bird was rescued from a small garden on the island at one point. The Dutch Nutcracker continued in Wageningen all week, while an excellent record concerned a photographer flyover Pygmy Cormorant at Gouda on 7th. The American Royal Tern was again seen around the Guernsey coastline on 6th and France's Rüppell's Warbler was still at Saintes-Maries-de-la-Mer to 8th. 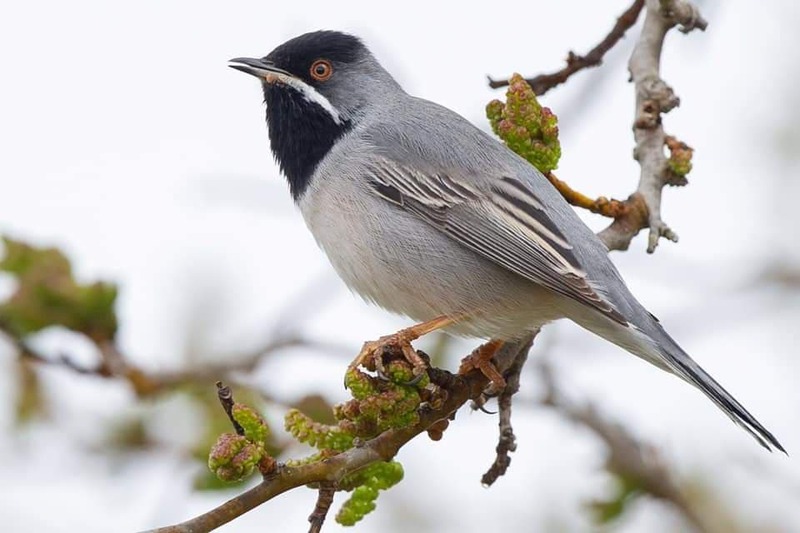 Rüppell's Warbler, Saintes-Maries-de-la-Mer, Bouches-du-Rhône (Antoine Joris). In Portugal, the Green Heron was still at Quinta do Lago, Algarve, on 4th. Poland's fifth Black-winged Kite was over Vistula Spit on 6th and an Oriental Turtle Dove was found at Hudiksvall, Sweden, on 4th. A Black Scoter was off Skagen, Denmark, on 3-4th. On Tenerife, the long-staying Semipalmated Plover was again seen on the coast near Los Abrigos on 5th, while the Dwarf Bittern lingered on Fuerteventura and the Hudsonian Whimbrel stuck around on Sal, Cape Verde. Azores news included the resident Pied-billed Grebe at Furnas, São Miguel. Hudsonian Whimbrel, Santa Maria, Sal (Uwe Thom).